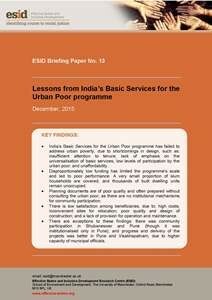 This briefing presents research into the effectiveness of India’s Basic Services for the Urban Poor (BSUP) programme. It examines the implementation of BSUP in five different Indian cities. Security of tenure, universalised services and institutionalised community participation are found to be key to successful inclusive urban development. These findings provide useful lessons for urban policy in India and elsewhere.